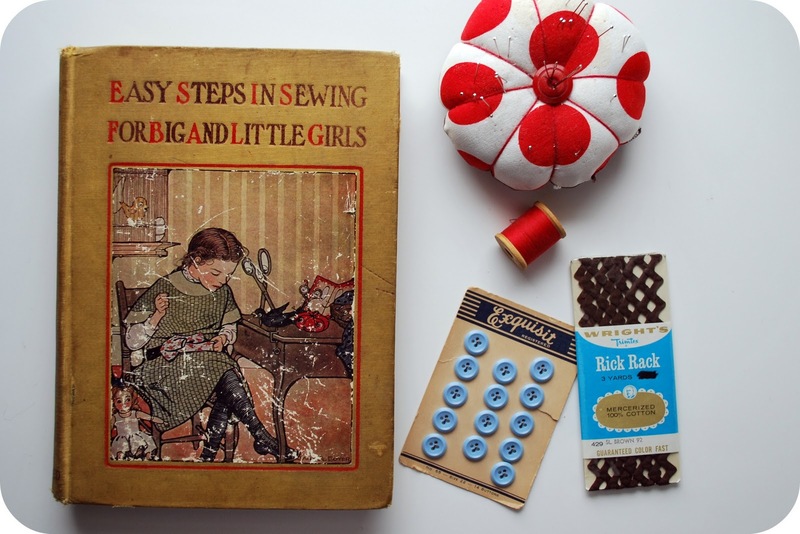 I received this beautiful and quirky old book from my friend, Kendra, as a Christmas gift this year--Easy Steps in Sewing for Big and Little Girls by Jane Eayre Fryer. 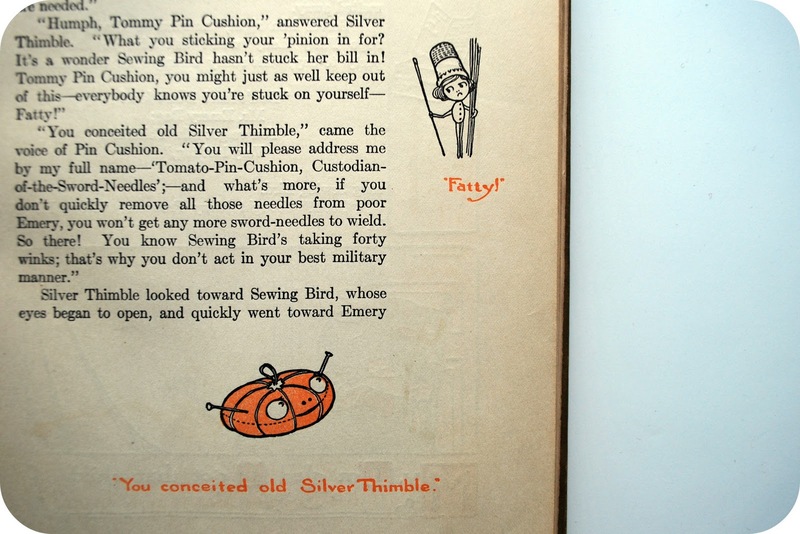 The book also has an alternate title found inside on the title page--Mary Frances Among the Thimble People--which alludes to how this sewing instruction book unfolds more like a story where all manner of sewing notions come to life and spend many an afternoon teaching Mary Francis how to sew the most lovely and exorbitant doll clothing--often offering their instruction in rhyme. You can see some of the book's main characters above--they appear in illustrations throughout the book. 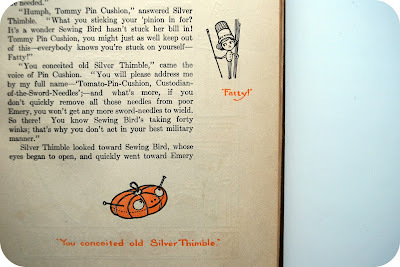 You can also see how perfectly rude Mr Silver Thimble can be, calling Tommy Tomato Pin Cushion a "fatty." Boys can be so callous to one another. The book was published in 1913 and as far as I can tell I must have a one of the early printings since it is inscribed to Arlyne Ostrom (from Mother), Xmas 1913 (love old inscriptions in books, don't you?). 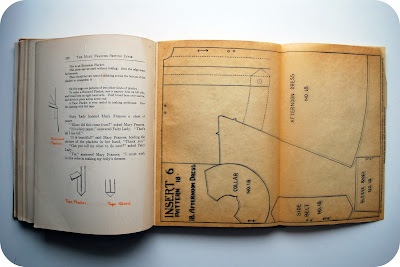 But the book is filled with instructions on how to do all the basics in sewing--all hand sewing, mind you--as well as how to do things I have never even heard of like felling on flannel, kensington outline stitch, and whipped ruffles. It also teaches how to darn which I have never done before but seems useful. 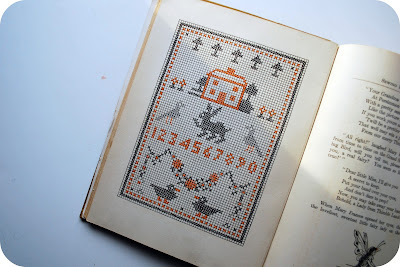 And then there are patterns--like this sweet and classic cross stitch that I feel compelled to make now even though I have somehow always felt that cross stitch is mundane and the equivalent of counting holes in ceiling tiles for amusement. But this pattern charms me...they call it a Grand Sampler on Canvas, which does make it seem a bit more glamorous. 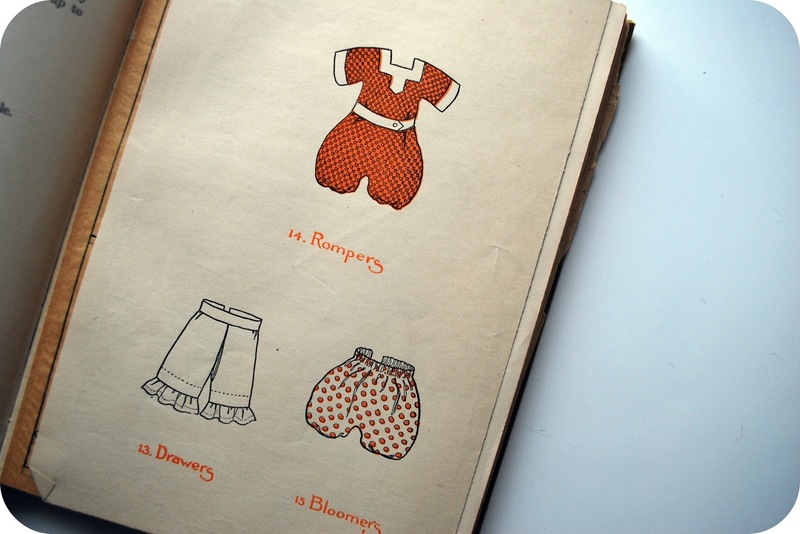 ...and even items of a racier sort like rompers, drawers and bloomers. Oh la la, mon cheri. 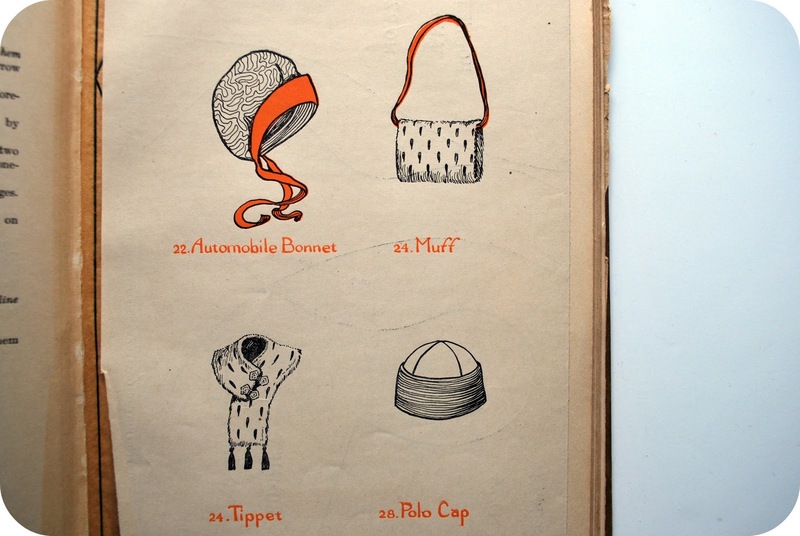 But the best part of the whole book is that it contains sheets of delicate and yellowed tissue paper patterns for all the clothes that fold out. My heart almost broke when I found these as I paged through the book--mostly because almost all the patterns are still there, just waiting to be unfolded and used. 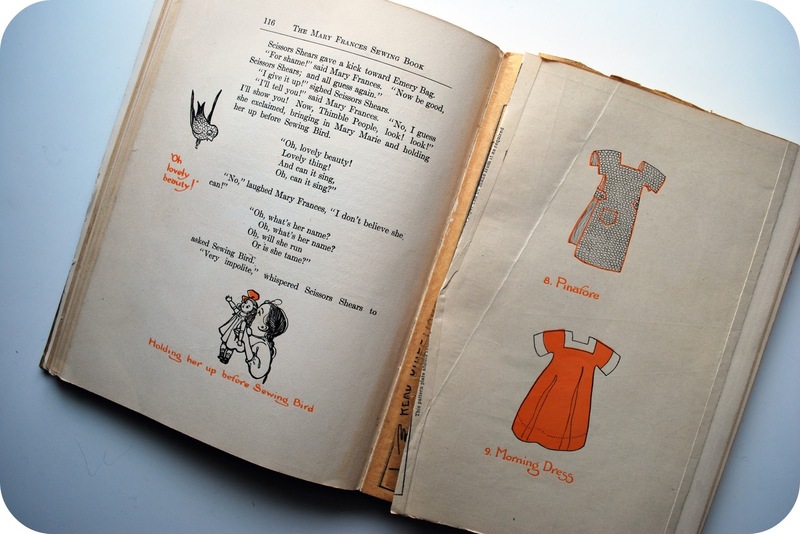 They are glued right into the book so that they reside right in with the instructions for a given piece of doll clothing. Like little sewing surprises awaiting you with each turn of a page. And you can count on this, I will report back at some point, having hunkered down and made something from the book--and then I will scan in the pattern and share it with you just in case you might want to make your own tippet too--or whatever. Update: As it turns out, this book is actually still in print. You can find a copy of it under the title, The Mary Frances Sewing Book--find it here. Isn't this the sweetest book?!? It looks like you have a beautiful copy. I have been using this book to teach my oldest daughter to sew (she's now 7.5) and I'll definitely use it with my other two girls. My daughter is currently working on the pinafore now. I've posted what she has made so far (you might have to search back a bit). here...these are the posts showing what she has made so far. I had NO IDEA that this book was still in publication and use--but with the new title of "Mary Francis Sewing Book". You can find it on Amazon. Also, please go have a look at Bybido's blog and her posts on the Mary Francis clothing she and her daughter have been making--amazing and wonderful stuff. Bybido, you have such a charming blog. I just subscribed! What an amazing old book...love that inscription! Lucky you. omg I have to have this! This book combined with your sewing kit will be perfect for my oldest daughter! Thanks so much! I heart your blog! Update! I just bought this on B&N- it was republished in 1998. And was originally part of a series. So I also picked up Adventures in Garden. Not as cute as your lovely original edition but still hardbound! I also have a reprint copy of this book, how lovely to see an old one! As another poster noted, it was part of a series, I have the Garden Book and Housekeeper, I believe there was also a knitting book and a cook book. I love that people are finding copies of this book and that it is still in print...wow. Does the new edition have tissue paper patterns in it still-or is it all templates? Holly--the new book has the patterns printed on heavy paper, they are in a pocket in the back of the book. Such a great blog, I'm so glad I came across it. 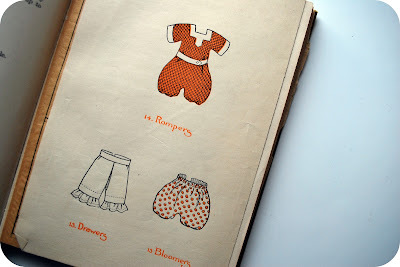 I'm in love with the idea of sewing doll clothes with my daughter. So glad this book is still in print, thanks for the heads up. Wow, this is a beautiful book! I'm going to have to see if i can get a copy in the UK now... the illustrations are so adorable! Have fun with the projects and keep us posted with how they go! That book looks great, so many nice outfits for the doll, I have to get my hands on it! !